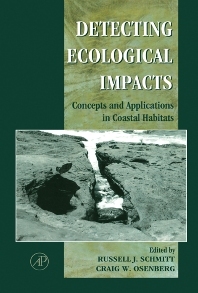 Detecting Ecological Impacts: Concepts and Applications in Coastal Habitats focuses on crucial aspects of detecting local and regional impacts that result from human activities. Detection and characterization of ecological impacts require scientific approaches that can reliably separate the effects of a specific anthropogenic activity from those of other processes. This fundamental goal is both technically and operationally challenging. Detecting Ecological Impacts is devoted to the conceptual and technical underpinnings that allow for reliable estimates of ecological effects caused by human activities. An international team of scientists focuses on the development and application of scientific tools appropriate for estimating the magnitude and spatial extent of ecological impacts. The contributors also evaluate our current ability to forecast impacts. Some of the scientific, legal, and administrative constraints that impede these critical tasks also are highlighted. Coastal marine habitats are emphasized, but the lessons and insights have general application to all ecological systems. Ecologists and marine biologists, especially those with applied interests, environmental scientists and consultants, resources managers, and policy makers. Graduate students and advanced undergraduates in these disciplines arealso part of the intended audience. University libraries and environmental consulting firms are likely buyers. Likely to be of broad interest in many related areas. C.W. Osenberg and R.J. Schmitt, Detecting Ecological Impacts Caused by Human Activities. A. Stewart-Oaten, Goals in Environmental Monitoring. G.P. Jones and U.L. Kaly, Criteria for Selecting Marine Organisms in Biomonitoring Studies. S.F. Thrush, R.D. Pridmore, and J.E. Hewitt, Impacts on Soft-Sediment Macrofauna: The Effects of Spatial Variation on Temporal Trends. C.W. Osenberg, R.J. Schmitt, S.J.Holbrook, K.E. Abu-Saba, and A.R. Flegal, Detection of Environmental Impacts: Natural Variability, Effect Size and Power Analysis. A. Stewart-Oaten, Problems in the Analysis of Environmental Monitoring Data. J.R. Bence, A. Stewart-Oaten, and S.C. Schroeter, Estimating the Size of an Effect from Before-After-Control-Impact-Pairs Design: The Predictive Approach Applied to a Power Plant Study. A.J. Underwood, On Beyond BACI: Sampling Designs That Might Reliably DetectEnvironmental Disturbances. P.T. Raimondi and D.C. Reed, Determining the Spatial Extent of Ecological Impacts Caused by Local Anthropogenic Disturbances in Coastal Marine Habitats. M.J. Keough and K.P. Black, Predicting the Scale of Marine Impacts: Understanding Planktonic Links between Populations. M.J. Kingsford and C.A. Gray, Influence of Pollutants and Oceanography on Abundance and Deformities of Wild Fish Larvae. R.M. Nisbet, W.W. Murdoch, and A. Stewart-Oaten, Consequences for Adult Fish Stocks of Human-Induced Mortality on Immatures. R.J. Schmitt, C.W. Osenberg, W.J. Douros, and J. Chesson, The Art and Science of Administrative Environmental Impact Assessment. R.S. Carney, On the Adequacy and Improvement of Marine Benthic Pre-Impact Surveys: Examples from the Gulf of Mexico Outer Continental Shelf. F.M. Piltz, Organization Constraits on Environmental Impact Assessment Research. C. Lester, Administrative, Legal, and Public Policy Constraints on Environmental Impact Assessment. R.F. Ambrose, R.J. Schmitt, and C.W. Osenberg, Predicted and Observed Environmental Impacts: Can We Foretell Ecological Change? Glossary. Author Index. Subject Index. University of California, Santa Barbara, U.S.A.
University of Florida, Gainesville, U.S.A.